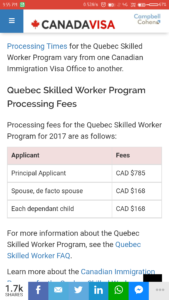 additional factors relating to a provincial nomination, a qualifying offer of arranged employment, Canadian study experience, a sibling in Canada, and/or French language ability. There is a total of 1,200 points available under the Comprehensive Ranking System. 600 points available for additional factors (including a provincial nomination, an offer of arranged employment, Canadian study experience, a sibling in Canada, and/or French language ability). 600 points available for additional factors. 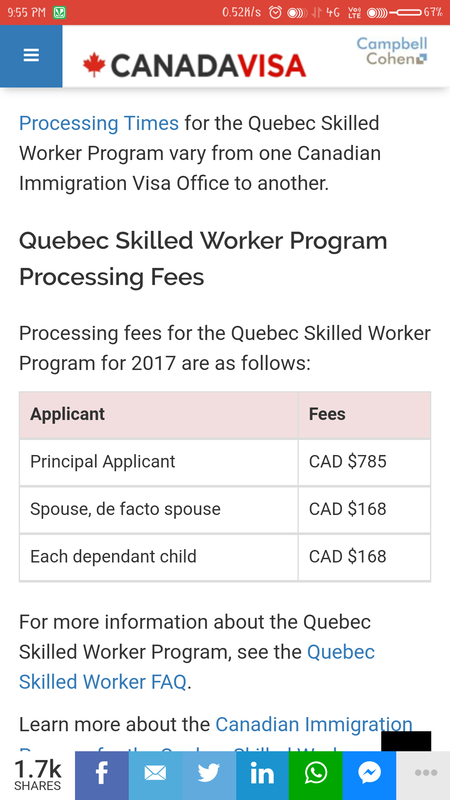 Apart from this, additional points are awarded to candidates with French ability and to candidates with a sibling in Canada. 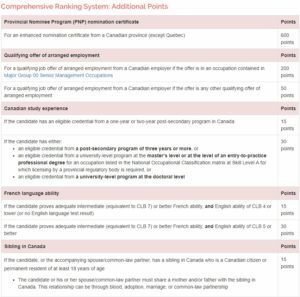 French ability : 15 additional points are awarded to French-speaking candidates who demonstrate requisite intermediate (equivalent to Canadian Language Benchmark 7) or better French ability, and English language test result of CLB 4 or lower, or no English test results at all. 30 additional points for French-speaking candidates who prove adequate intermediate or better French ability, and who also prove English language test result of CLB 5 or better. Sibling in Canada: 15 additional points are awarded to candidates with a sibling in Canada who is a Canadian citizen or permanent resident of at least 18 years of age. These points may also be awarded if the candidate’s spouse or common-law partner has a sibling in Canada. The candidate or his or her spouse/common-law partner must share a mother and/or father with the sibling in Canada. This relationship can be through blood, adoption, marriage, or common-law partnership. Skill Transferability Factors: A maximum of 100 points are awarded for a candidate’s skill transferability factors. There are five combinations of such skill transferability, with a maximum of 50 points awarded for each combination. 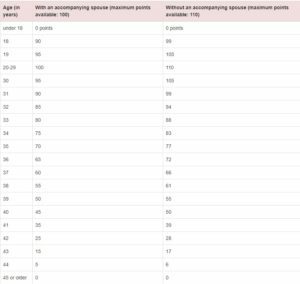 Even if a candidate scores more than 100 points in total, only 100 points will be awarded under the Comprehensive Ranking System. 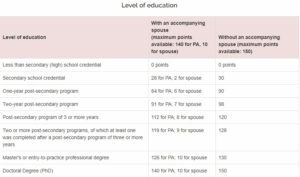 Candidates with or without an accompanying spouse or common-law partner are awarded points for skill transferability in exactly the same way. There are no points available for the skill transferability of a candidate’s spouse or common-law partner. 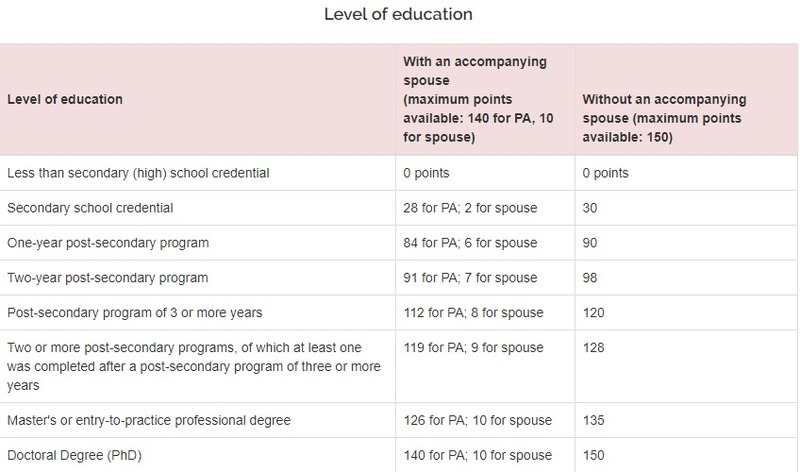 Nevertheless of how many siblings the candidate has in Canada, a maximum of 15 points may be awarded for a sibling in Canada. The maximum available number of points for these supplementary factors for any one candidate is 600 points. 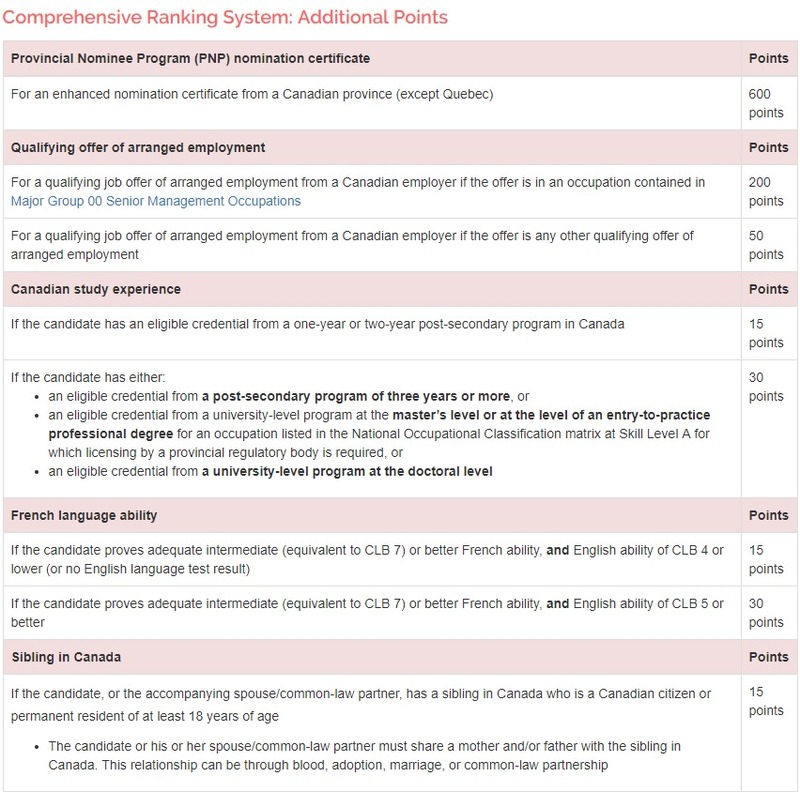 Therefore, if a candidate has completed a Canadian post-secondary study program and obtains an enhanced nomination certificate from a Canadian province, he or she will be awarded 600 points for these additional factors (rather than 615 or 630 points).